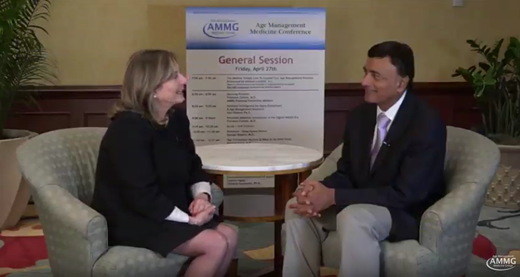 In this conversation with Florence Comite, M.D., Dipnarine Maharaj, MB.Ch.B., M.D., FRCP talks about transferring young, healthy plasma to elderly, frail individuals. Dr. Maharaj is Medical Director of the Maharaj Institute of Immune Regenerative Medicine in Boynton Beach, FL. 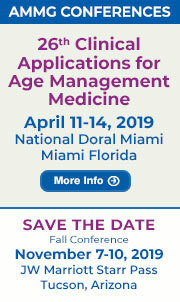 A pre-conference track at the upcoming AMMG Conference in Miami will cover the foundations of Age Management Medicine, including nutrition, supplements, fitness, hormones, assessment protocols, and legal basics of importance to any physician. 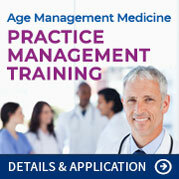 AMMG has launched its online CME program, with the latest Age Management Medicine focused education presented by world-renowned faculty in a convenient, web-based format, allowing you to obtain your CME requirements on your schedule. Does Hormone Replacement Therapy Increase the Risk of Blood Clots? There’s growing evidence that distinct racial and ethnic disparities in prostate cancer treatment contribute to African-American men having the highest risk of dying from it. Fitness professionals say these are the exercise trends to watch this year. Here's how to use them to your advantage. Patients should be informed of a possible risk for Alzheimer’s disease with prolonged use of hormone therapy, even though the absolute risk elevations are small. Hundreds of retired physicians have shined a light on what makes them successful, satisfied and confident in this stage of life. Scientists are working on a promising approach for treatment of chronic kidney disease: regeneration of damaged tissues using therapeutic cells. 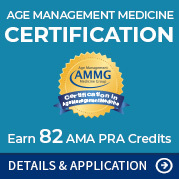 The Age Management Medicine Group (AMMG) is a division of Red River Solutions, Inc. with a goal of providing education and information on the sub-specialty of Age Management Medicine to physicians and healthcare professionals through evidence based continuing medical education conferences, workshops, seminars and publications. Age Management Medicine is a proactive, preventative approach focused on preservation of optimum human function and quality of life making every effort to modulate the process of aging prior to the onset of degenerative aging. The basic tenets of Age Management Medicine are patient evaluation through extensive medical history, lifestyle assessment, physical examination and laboratory evaluation to establish personalized proactive treatment plans consisting of proper diet, exercise, stress management and appropriate medical interventions. Copyright 2019 AMMG. All rights reserved. This publication is protected by United States copyright and other intellectual property laws and may not be reproduced, rewritten, distributed, re-disseminated, transmitted, displayed, published or broadcast, directly or indirectly, in any medium without the prior written permission of AMMG.